Turtles and Scallopers: Do They Mix? Using the rangefinder to take vessel locations. The Big Bend of Florida serves as important habitat for a wide variety of marine species, including three species of marine turtles: loggerheads, Kemp’s ridleys, and green turtles which are all listed under the Endangered Species Act. Specifically, the coastal seagrass beds in the region act as important foraging and developmental habitat for these species of turtles. This area also supports major recreational opportunities such as the Florida bay scallop fishery which brings thousands of people out onto the water from Bay to Hernando county between late June and late September annually. Coincidentally, the primary scalloping grounds overlap with the seagrass beds turtles use. Unfortunately, the effects of increased human use on turtle foraging patterns is unknown and it is thought that high densities of people out on the water may displace turtles from their foraging grounds into less productive habitats. 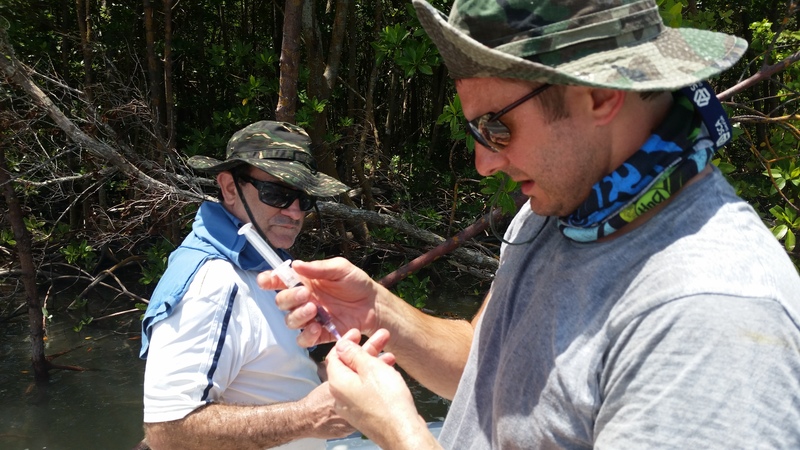 Attaching a satellite transmitter to a small green turtle. Photo taken with all applicable state and federal permits in place. Fieldwork began in May 2016 where I attached ten satellite transmitters to two species of turtles: Kemp’s and greens. The transmitters will allow me to figure out how turtles are moving in the environment and also help me determine if there was a change in movement after the scallop season opener in late June. Next, I began assessing human use of the area with countless hours spent on the water with my volunteers getting vessel locations using a handheld rangefinder. 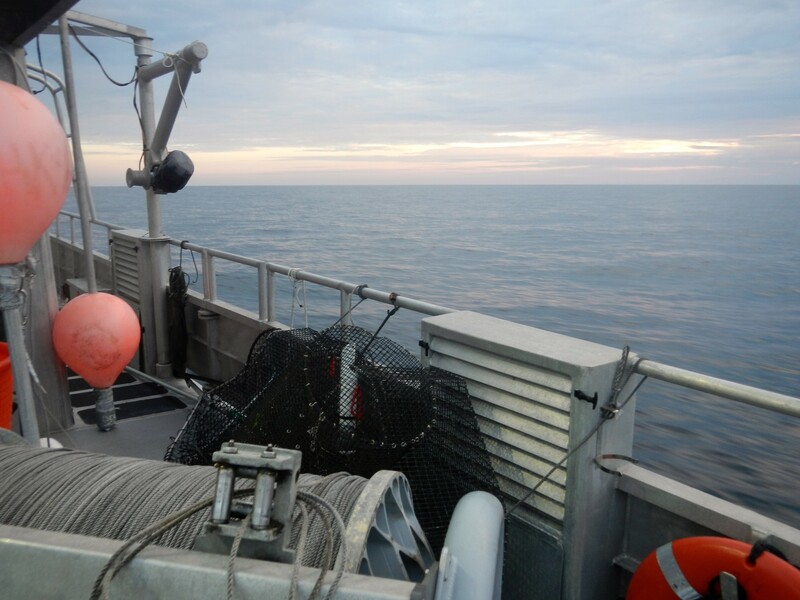 To date over 3,600 boat locations have been collected along 12 miles of coast with over 3,000 of them counted during the scallop season alone. At the same time I have been assessing the different habitats in the area to see if certain areas provide higher quality habitat. Finally, I have been opportunistically catching turtles from the side of the boat to get a better idea of the specifics for each turtle population in the area. 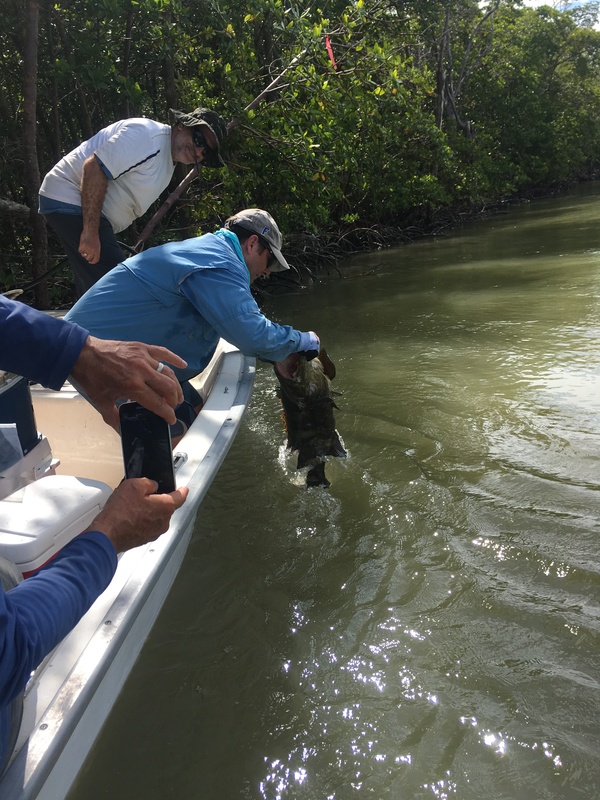 Capturing a male loggerhead in Crystal River. Photo taken with all applicable state and federal permits in place. The next phase of the project is to create a habitat map to overlay with turtle sightings and tracking data which will tell me if there are specific habitat associations for each species. I will also look at if there are any effects from the scallop season on turtles by looking at movements before and during the scallop season and matching them with boat locations and high density scalloping areas. Hopefully this information can be used to inform and educate the public on marine turtles in areas where they recreate. Notice the teeth of this Sheepshead caught on artificial reef near Dog Island, Florida. 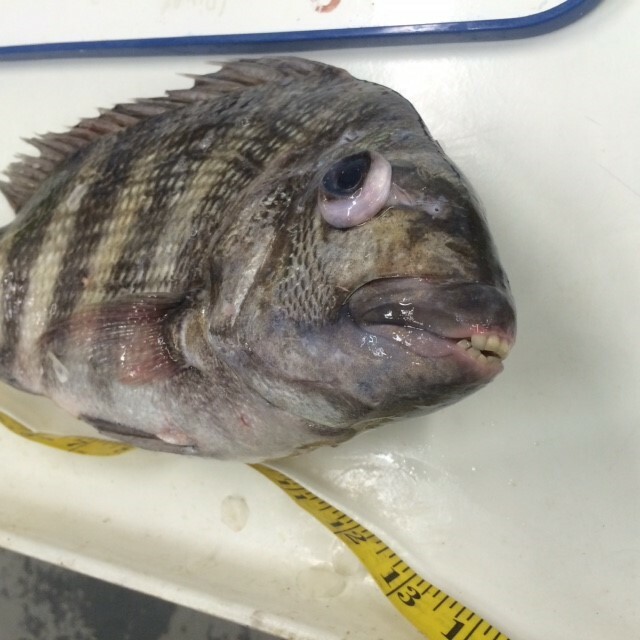 In the Gulf of Mexico, the Sheepshead are famous (or infamous) for their human-like teeth. Their teeth produce a smile matched by no other fish species. Tourists and land-dwellers often marvel at the Sheepshead’s teeth when they first encounter them. Despite what their outward appearance may imply, Sheepshead are a tasty fish, frequently sought after by recreational fishers in the Gulf of Mexico. Unfortunately, Sheepshead are almost exclusively targeted during their spawning season. This could result in a potential problem. The fishing spawning populations has resulted in declines of other fisheries species. Although I must admit that Sheepshead teeth are quite a spectacle, I personally find their biology more fascinating and important. 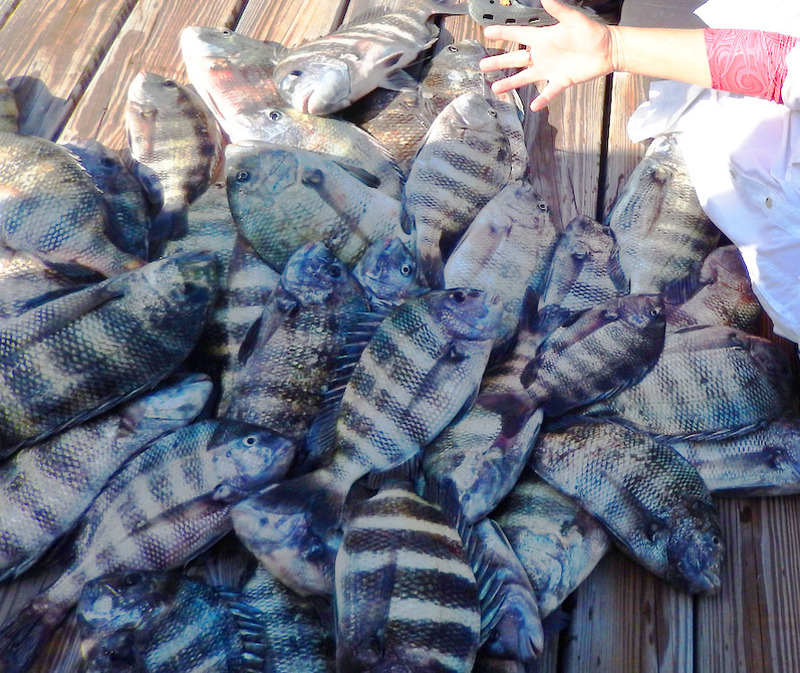 Hundreds of Sheepshead caught during a fishing tournament hosted by Sanibel Island Fishing Club during March 2014. The first part of my research examined the reproduction and movement patterns of Sheepshead in the NE Gulf of Mexico. The first step was to determine where Sheepshead were spawning. I used data collected from a previous study in our area, along with communication from the local fishing community, to choose my study sites. I ended up choosing three artificial reefs for my study near Dog Island, FL. I used a Go-Pro mounted drop camera system to monitor monthly Sheepshead abundance on these reefs from August 2015 to August 2016. I found Sheepshead were basically absent from these reefs during summer and fall. 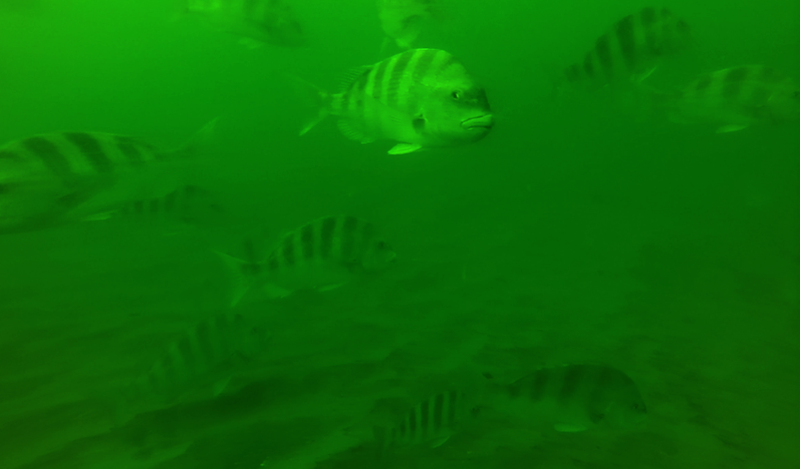 However, in January, hundreds of Sheepshead showed up on these artificial reefs. This was exciting! A healthy population of Sheepshead remained on these reefs until April, after which they completely disappeared. Sheepshead aggregation on artificial reef. Over 100 Sheepshead were observed on each 20 second rotation. Now, I needed to determine if Sheepshead were indeed spawning on my study sites. To do this, I sampled from each reef population from January-April. Using histology, a nifty technique that allows you to observe tissue in detail, I found presence of hydrated eggs and post-ovulatory follicles. These indicated a presence of actively spawning individuals on all three reefs. I found evidence of Sheepshead spawning aggregations! In the past couple of months, I have been presented with an exciting opportunity to further investigate the movement patterns of Sheepshead. Dr. Chip Cotton of the FSUCML received a grant to deploy a number of acoustic receivers array in Apalachicola Bay. The receivers will be strategically deployed to block off any exit from the Bay to the Gulf of Mexico. This allows you to capture movement offshore. Luckily for me, Sheepshead spend the majority of their life cycle in estuaries (like Apalachicola Bay). Austin Heil holding up a Sheepshead caught during Saturday at the Sea summer camp, hosted by the FSUCML. Starting in late November 2016, I will be tagging 15 Sheepshead with an acoustic tag in Apalachicola Bay. These acoustic tags will transmit to the receivers and track the movement of each fish inside the Bay. Ultimately, I want to capture when Sheepshead start their migration out of the estuary to offshore habitats. By tracking their movement, I will be able to determine the triggers (e.g. tides, water temperature, etc.) that initiate their migration offshore. 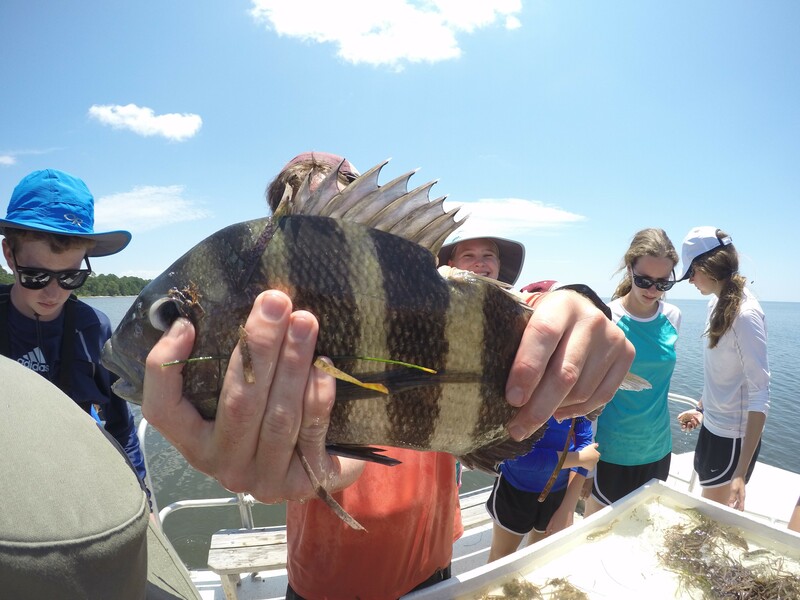 You can help fund Austin’s Sheepshead research, by donating here! On Wednesday 4th May, I drove across Florida to West Palm Beach to meet the Waitt Foundation vessel, the M/V Plan B. It started out as a lovely sunny day but quickly deteriorated into a torrential downpour that lasted the rest of the trip. 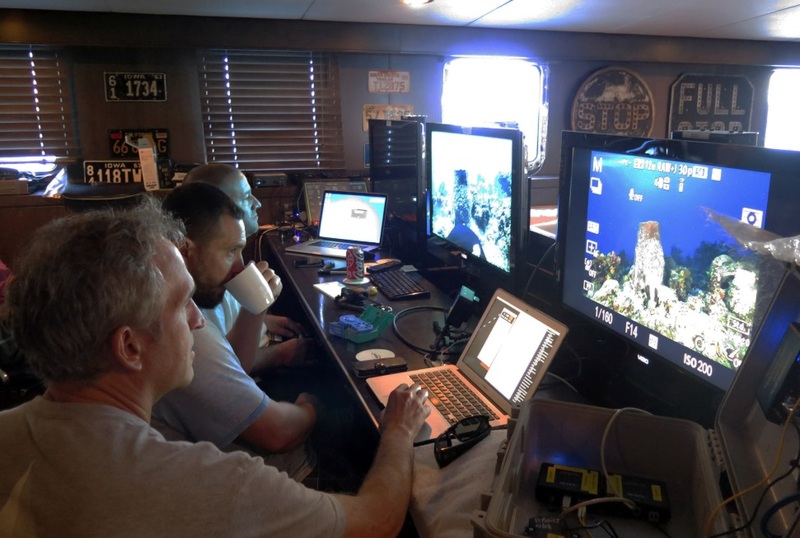 I arrived in West Palm, just in time to load my gear and hop on the boat before it left for Pulley Ridge, a unique mesophotic coral reef in the eastern Gulf of Mexico. Mesophotic or ‘twilight zone’ reefs are on the edge of the depth limits for reef-building corals that need sunlight to support their symbiotic algae. Their depth and distance from shore lends them some protection from high temperatures and human impacts, so they may represent refuges for corals and other reef species that can no longer survive in the degraded shallow areas. This cruise is part of a larger project that is supported by the Waitt Foundation in collaboration with National Geographic and the Marine Conservation Institute. Brian Skerry, a National Geographic photographer, is aboard to collect images that highlight special marine ecosystems. My colleague John Reed (Harbor Branch Oceanographic Inst/FAU) and I are collecting benthic habitat and community data on the Pulley Ridge reefs. It was a rough trip down with strong winds and high seas, but we arrived at Pulley Ridge late Thursday night ready to start work. 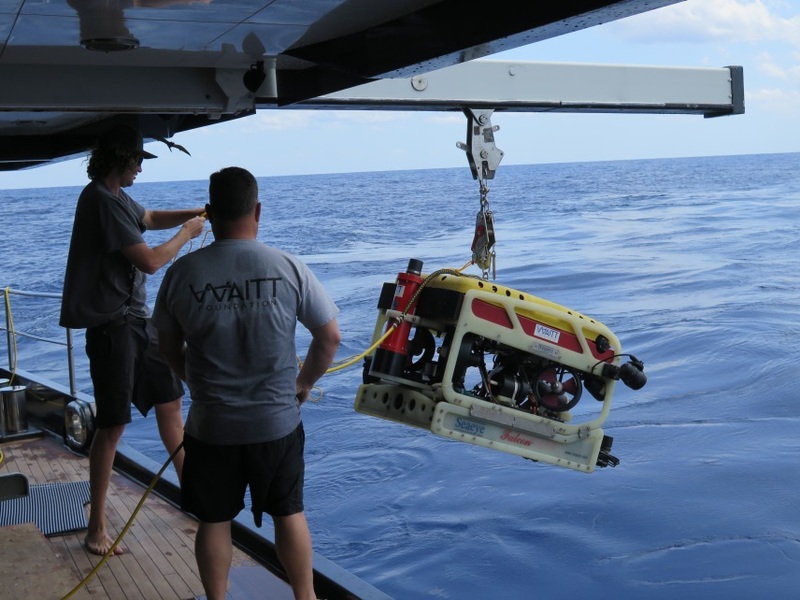 We finally caught a break in the weather and deployed the Falcon ROV (See image above) on the main ridge inside the Pulley Ridge Habitat Area of Particular Concern (HAPC). Conditions were not ideal; we were being pushed around by the current and wind, but we saw some large red grouper excavations, each with attendant lionfish (unfortunately), fan-shaped green algae that only grows on Pulley Ridge, and large flat plates of coral that are characteristic of these mesophotic reefs. Growing as a plate instead of a boulder allows the corals to take advantage of the limited light (See image below). Towards the end of the dive we were venturing into territory that had not been explored before, and found a massive basin (probably a red grouper excavation) with hundreds of tiny fishes as well as large red grouper, scamp and black grouper. At this point the current pulled us off the reef and signaled the end of the dive. 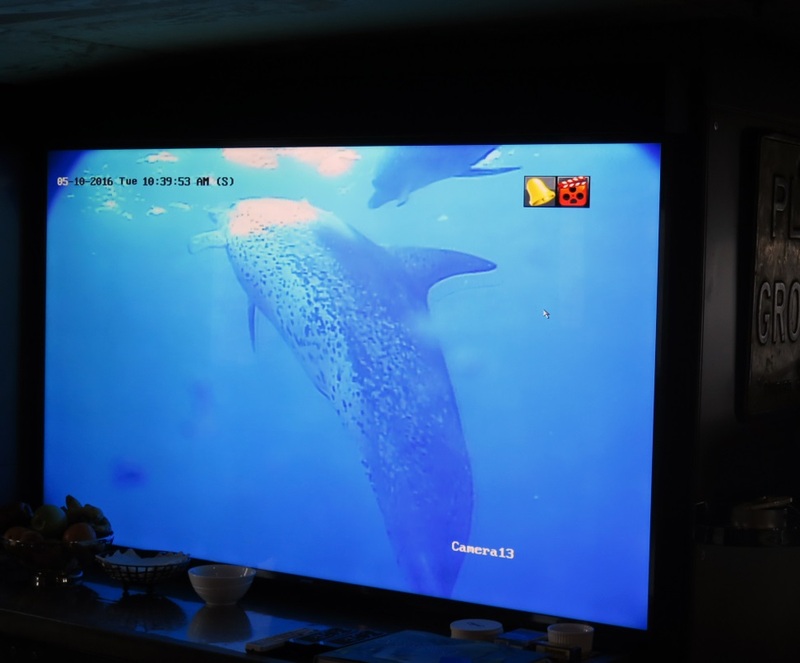 Saturday and Sunday were again battles with nature with high seas and strong currents, but we managed two ROV dives on the western ridge before having to give up for the day. This part of Pulley Ridge is inside the HAPC but is outside of the small part of the total area that has any protection. This area is deeper than the main ridge and has a dense covering of gorgonians, sponges and many other invertebrates and fishes. An expansion of protection for Pulley Ridge has been proposed to the Gulf of Mexico Fisheries Management Council as part of a larger effort to protect deep sea corals (those > 50 m depth) in the Gulf of Mexico. Any additional data we can collect on the proposed protected areas may help move them forward. Who lives on some substrate under the sea? Sponges! Absorbent and colorful with many different irreplaceable functions! 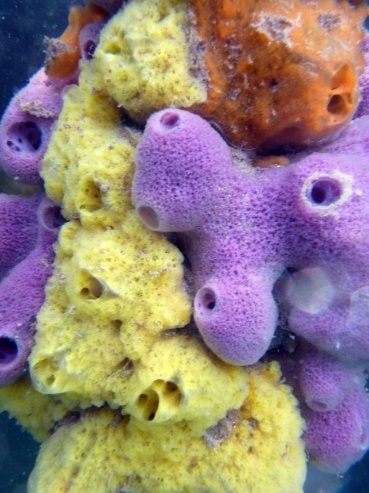 Sponges are one of the only organisms that can directly filter bacteria sized particles from the water column. They filter at incredible rates and efficiency, clearing at least 95% of bacteria from the water. Loss of sponges in Florida Bay has been linked to increases in phytoplankton blooms, which are devastating to sponges, fish, and many benthic invertebrates. Besides their awesome filtering abilities sponges are also involved in a myriad of interactions. Sponges can be considered “living hotels” to hundreds of species of tiny animals such as sea spiders, worms, crustaceans, and brittle stars. 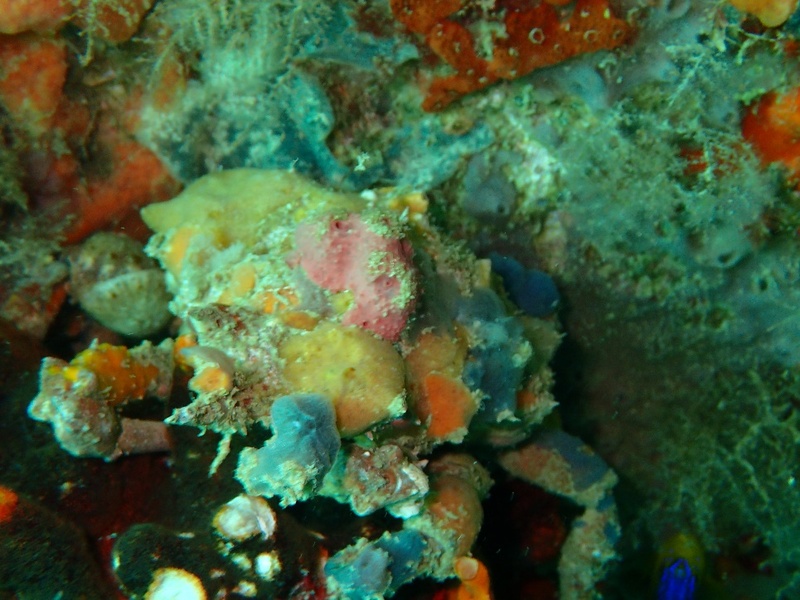 Some symbiont species use the sponge as both a refuge and a food source! 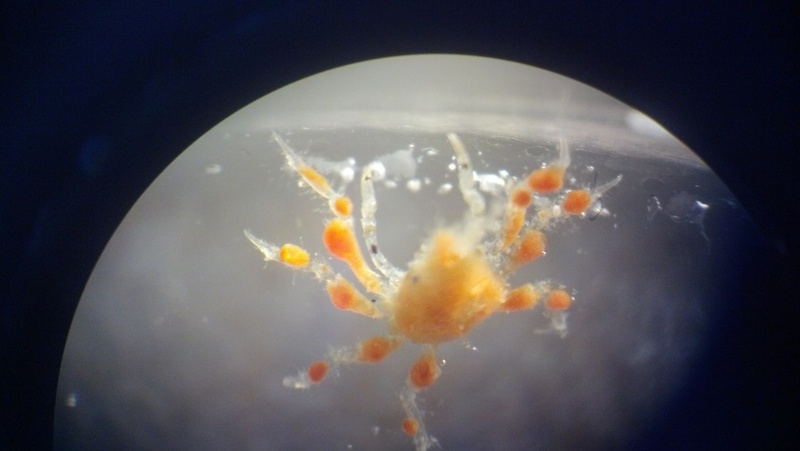 Crustaceans can provide a mobile home for sponges, and in turn one species of hermit crab lives inside a sponge that completely covers its shell and then continues to grow as the hermit crab grows; and decorator crabs can choose to decorate themselves with sponges that camouflage them from their predators! Sponges growing on mangrove roots protect them from small crustaceans that bore holes in the roots, killing the tree. In turn, the mangrove roots provide a stable substratum for the sponges in a habitat with abundant plankton on which sponges feed. Sponges glue corals onto reefs, and protect the vulnerable undersides of corals from organisms that bore holes in coral skeletons. Sponges also filter bacteria out of the water column, maintaining clear water required by corals. 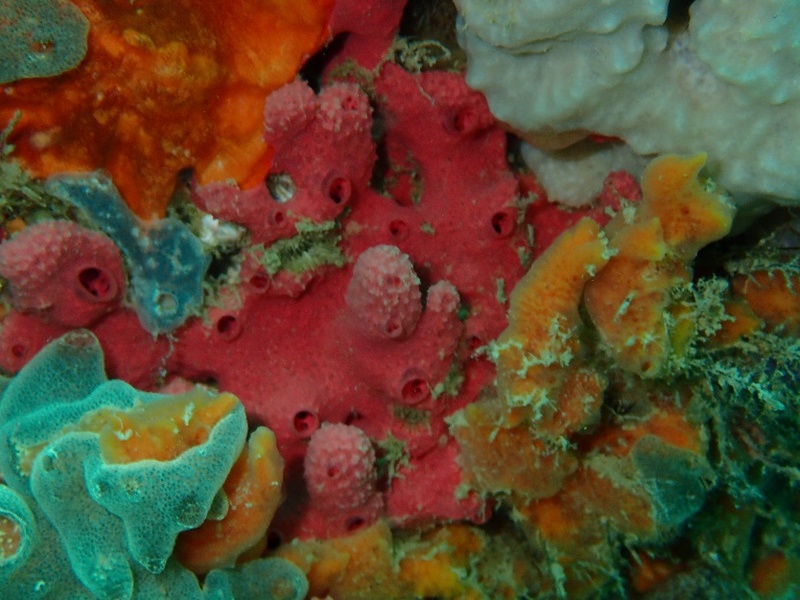 Sponges and zooanthids can protect each other from predators. 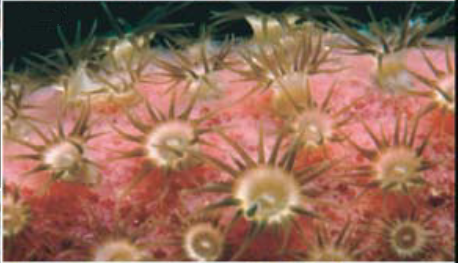 Zooanthids are tiny colonial anemones that embed themselves in the surfaces of sponges, living in close association for the rest of their lives as a sort of 2-species ‘super-organism’. Sponge predators include Hawksbill sea turtles, angelfish, starfish, and nudibranchs! Sponges have unique chemical defenses that deter most predators, but angelfish overcome this by eating small portions of each of many different sponge species. Sea stars will “taste” a sponge with their tube feet then, if they like it, they climb onto it and release digestive enzymes. Nudibranchs eat a crevice into the sponge and then remain tucked inside. Leg one of the 2016 Florida Restore Act Center for Excellence Program (FLRACEP) cruise threw many challenges our way, including rough seas and heavy currents. Our first fish of the year was a yellowedge grouper (Epinephelus flavolimbatus, top left). 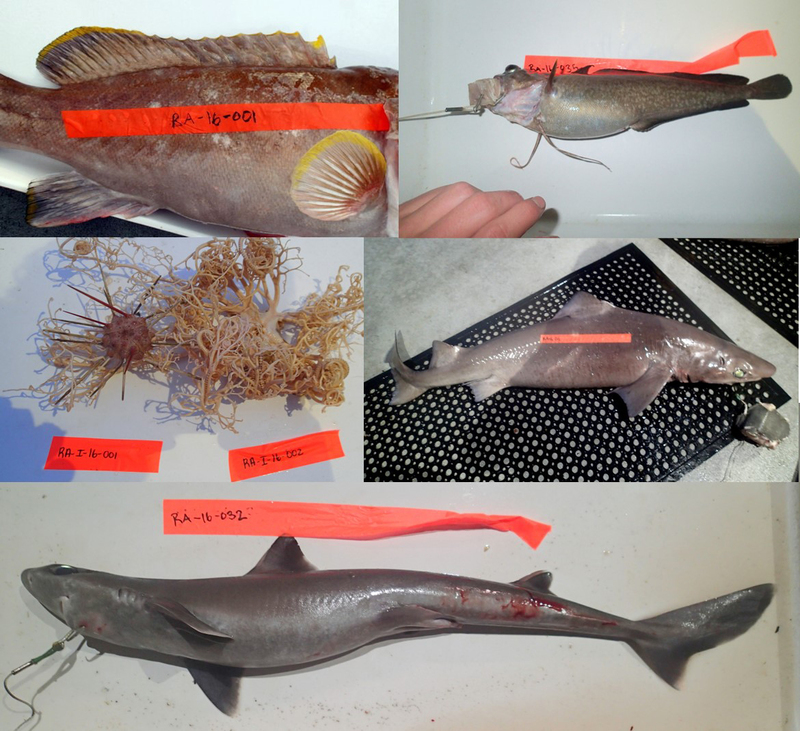 This is one of the species that we have caught repeatedly over the five years of our survey, as well as hakes (top right), gulper sharks (Centrophorus granulosus, middle right) and shortspine spurdog (Squalus cf. mitsukurii, bottom). 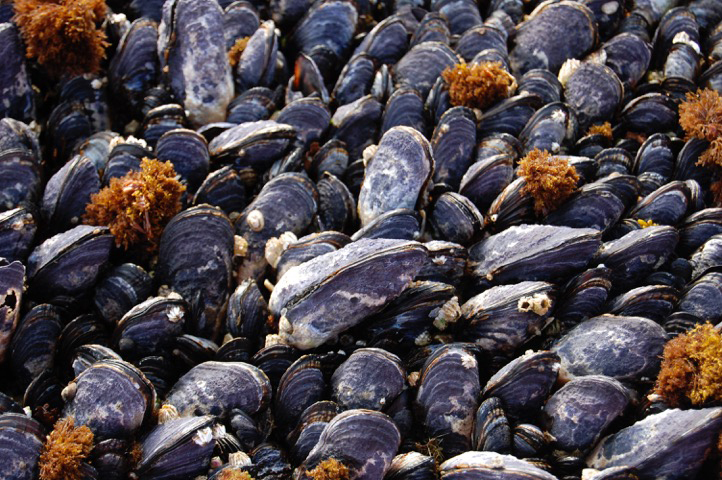 Repeatedly sampling these species over the years and in several different regions (i.e. West Florida Slope, east and west sides of DeSoto Canyon) provides valuable toxicology samples so that Dr. Jim Gelsleichter and his students at the University of North Florida can continue to evaluate the presence of persistent contaminants such as polycyclic aromatic hydrocarbons (PAH’s) from the 2010 Deepwater Horizon Oil Spill. 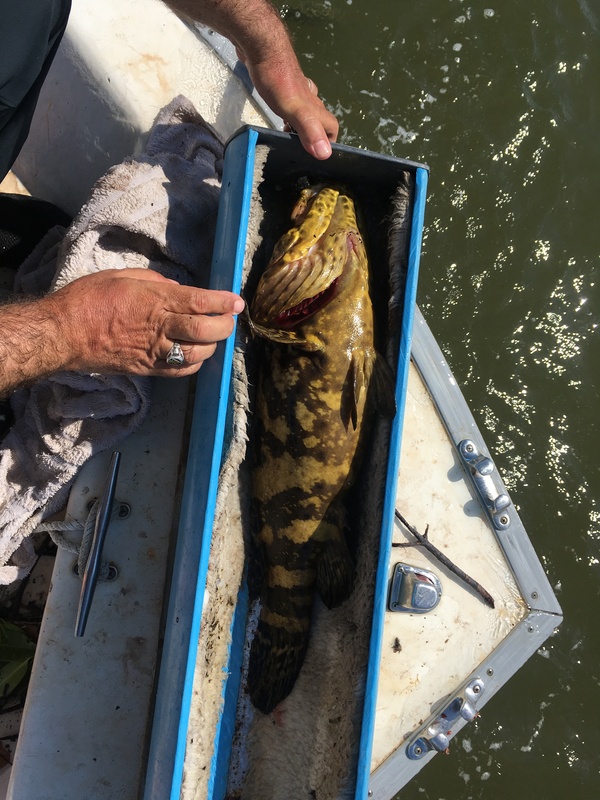 The hake pictured in the top right is actually a new species for our survey (Carolina hake, Urophycis earlyi) and it will be preserved in the FSUCML Ichthyological Collection. Typically, we catch Gulf hake (U. cirrata) and Southern hake (U. floridanus), and rarely, Spotted hake (U. regia). Just in case you were wondering about the strange letters in the middle of the shortspine spurdog’s scientific name (cf. ), this stands for “conferred as.” This species is part of a circumglobal species complex that is currently undergoing re-description. In other words, there are several species around the world that look like this one and have all been called by the same name. However, they are actually different species. 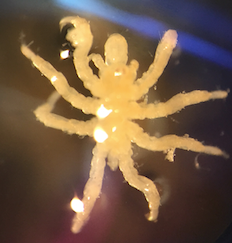 This one in particular is being re-described by Mariah Pfleger, a recent master’s student in Dr. Toby Daly-Engel’s lab at University of West Florida. She found that this species in the Gulf of Mexico is in fact distinct from the others around the world. It will have a new name in the next year or so. We find some amazing invertebrates in the deep sea. This beautiful urchin and basket star (middle left) came up from the bottom tangled with each other and around our longline. We don’t know what species they are, but perhaps FSUCML faculty Dr. Sandra Brooke will be able to tell us! NOTE: We asked Dr. Sandra Brooke, and here’s what she had to tell us – the right hand side of the picture is a basket star, member of the family Gorgonocephalidae, and the left hand side of the picture is a pencil urchin, member of the family Cidaridae. 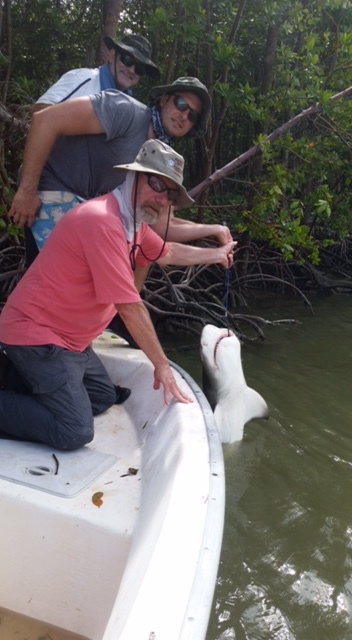 Clark Morgan was lucky enough to see his first bluntnose sixgill shark on leg one before he had to head back to school. Unfortunately, she broke the barb on the hook and swam away before we were able to get good photographs or tag her. Another UNF master’s student, John Whalen, took Clark’s place and FSU research technician Bryan Keller joined the team for leg two. We are headed out to our first set of stations in the northern Gulf. We’ve rigged some new weights for the longlines, added two more hanks of line to our spool, and we’re being treated to calm seas. Everyone is ready to start fishing again. Wish us luck! We are having beautiful weather as we steam toward our first set of stations on the West Florida Slope. After we had stowed most of our gear securely, fellow FSUCML grad students, Bianca and Brian; UNF grad student Clark; and I sat at the galley table and prepared flagging tape with individual numbers to tag each fish when it comes on board, and vials with the same numbers for storing fin clips and muscle biopsy samples for genetics and stable isotopes research. When we start fishing, our first fish will be RA-16-001 (that stands for Restore Act, as in FL Restore Act Center for Excellence Program, 2016, and the first fish). Bianca also prepared syringes for collecting blood sample for her reproductive and stress physiology research. With the team working together, we got this done pretty quickly and we’ve had time to read, nap, work and acquire our sea legs. Stay tuned for more information about our research cruise.